I recently rediscovered the awesomeness of Diigo. Diigo has quickly become my go to bookmarking app. I love Diigo for a variety of reasons. Most importantly would be the fact that anything I bookmark is saved online allowing me to access the information from any computer. I can also do a keyword/hashtag search for specific bookmarks right from Chrome's omnibox without having to go directly to diigo.com. To get started using Diigo you will want to visit the chrome web store to install the Diigo Web Collector extension. Clicking directly on the Chrome extension or pressing Ctlr - Alt - D on your keyboard activates the Diigo drop down menu that allows for you to save & annotate any webpage or pdf. Users can highlight terms and post sticky notes all over a specific webpage. Once a specific site has been annotated, Diigo provides the user with an annotated URL link that can be shared with others. There is also the option to mark a site as Read Later which is a handy feature if you come across an interesting article, but don't have the time to read it at that moment. 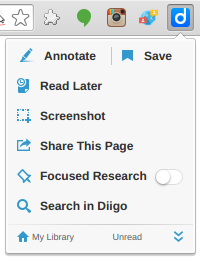 Additionally, Users have the option to share any bookmarks or annotations they save to specific groups within the Diigo Community. Below is an example of a link with a comment I shared to the Holman Diigo Group. Other members of the group will now have access to any and all links shared to this group with the option to reply and post additional insight. This would be ideal for students working in groups on an assigned research topic. Lastly, all saved bookmarks will appear in My Library where you have the option of making those bookmarks public or private. Teachers can apply for a free Diigo educator account that allows you to enroll your students and create groups for each class arranged by topic, period, content level, research area, etc. As students stumble across relevant information about a certain topic they can save their findings to the class group for others in the class to view, comment, and/or annotate.